It’s probably the most-overlooked museo nazionale Romano — but for a history buff, or someone simply trying to wrap their head around Rome’s many, many years of evolution, the Crypta Balbi deserves a stop. The museum’s big claim to fame is that it stands on remains of the Theater of Balbus (13 B.C. ), and you can still go down and see the ruins, today hidden beneath the modern museum (above). While that’s cool — and, after such neat underground experiences as the columbarium of Pomponio Hylas or the Mithraic temple beneath the Circus Maximus, I’m aware I might be a bit jaded biased — it wasn’t, for me, the best part of the Crypta Balbi. Particularly as the signs for the underground section were rudimentary and confusing, making it near-impossible for anyone but an archaeologist to be able to figure out what was what. 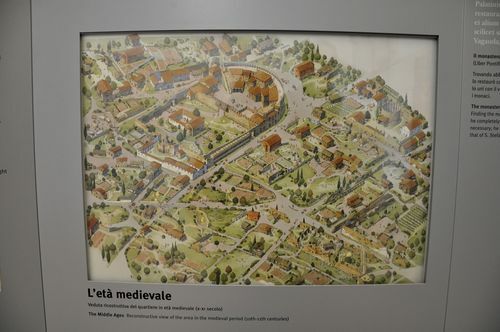 So why go to the Crypta Balbi? 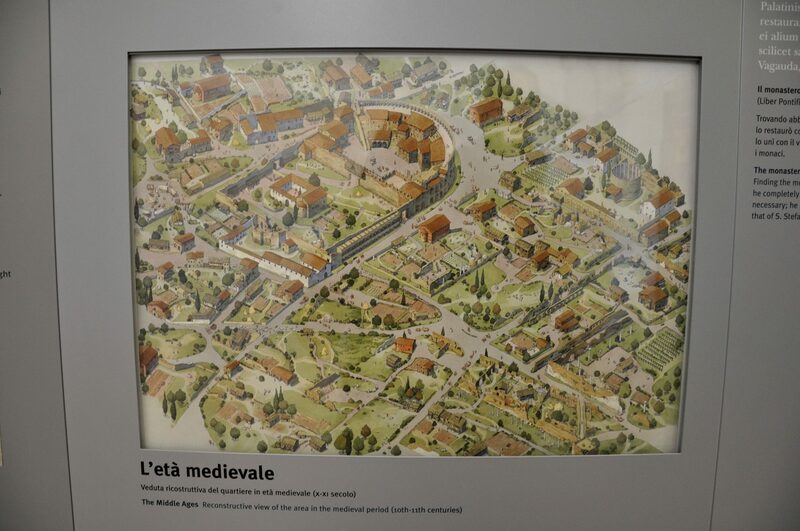 In all honesty, because it’s the first museum I’ve found that lays out what the historical center of Rome looked like in ancient times, in the Middle Ages, and through to today. With accompanying artifacts. No, it’s not with cutting-edge technology. But those maps and pictures? They’re pretty darn helpful. 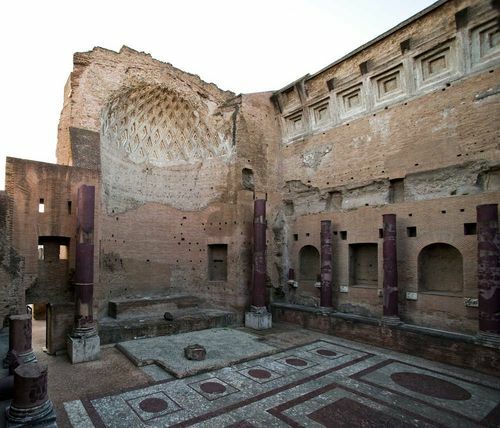 Now, when I walk past the Largo Argentina or by the Theater of Marcellus, I have a much, much clearer image in my mind of what not just particular buildings, but whole neighborhoods, would have looked like. (Below, the Crypta Balbi area in the late-antique and medieval periods). 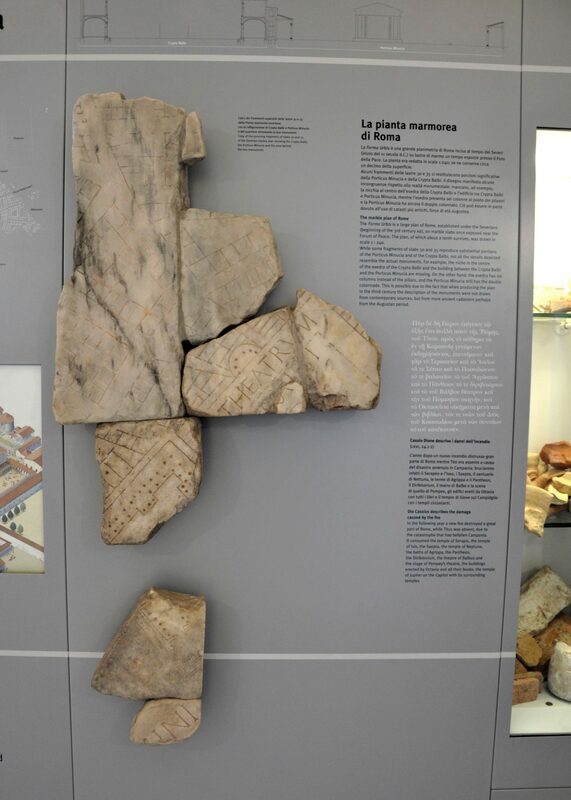 The artifacts in the museum, meanwhile, are actually much more extensive than I’d expected, with artifacts like the Forma Urbis Romae, a 60-by-45-foot marble map of the city that Emperor Septimius Severus mounted in the Forum to help 3rd-century visitors to the city. (Today, obviously, only fragments remain. But it’s still cool to see). Despite its treasures, the Crypta Balbi isn’t a particularly large museum. And that’s kind of nice. It means you can easily see the underground, look at all the artifacts, and wrap your mind around ancient Rome in about an hour and a half. And, after a day at the Vatican or an afternoon at the Palazzo Massimo, don’t discount the merit of not being exhausted after a museum trip. 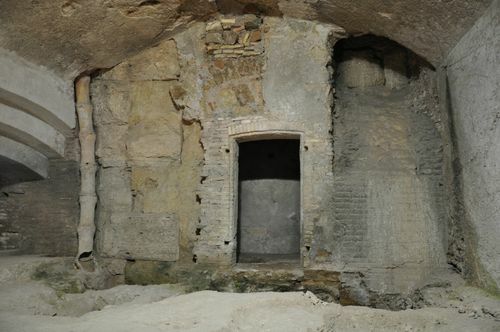 The Crypta Balbi is open daily from 9am to 7:45pm, except Mondays. The ticket (€7 full, €3.50 reduced) is valid for three days at not only the Crypta Balbi, but also the Palazzo Massimo, Palazzo Altemps, and Baths of Diocletian. It’s located at Via delle Botteghe Oscure 31. Here’s a map of Crypta Balbi’s location. 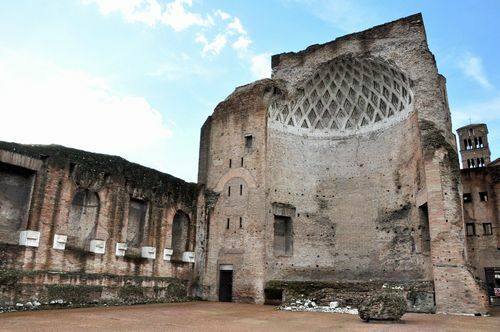 It was a big, big deal when the Temple of Venus and Rome opened this month after a 26-year restoration. And so I was pretty psyched to go see it. But I should, maybe, have been a little more tempered in my excitement. First: Let me just say that the Temple of Venus and Rome is beautiful. It's also massive; at 350 feet long and 150 feet wide, it's thought to have been ancient Rome's single biggest temple. And it's impressive that so much of it is around today, given the fact that it was built by the emperors Hadrian and Antoninus Pius from 121 to 141 A.D.
More gushing goes to the fact that the restoration is (finally!) finished. It took €264,034.80 (although after €100,000, who's counting that €.80?) and 26 years, and it's done… and done well. So what was I slightly-less-excited about than I otherwise would have been? Well, the fact that I was expecting, from the hubbub of media articles surrounding the temple's re-unveiling, the visitable part to look something like what you see below. In fact, though, that part is closed to the public: All you can do is peek through the window, getting a glimpse of the floor (although not of the apse). (The photo is the promotional photo used by Rome's culture ministry). An archaeologist at the Sopraintendenza office around the corner from the temple told me it's because the marble is just too delicate. And, as a big proponent of, you know, keeping old stuff preserved, I can completely support the choice to keep that section roped-off to the public. Still, after seeing articles like this one with images of people walking around the cella, I couldn't help but be disappointed. Just a little bit. Then again, I know I'm just being greedy. And picky. And wouldn't even feel this way had I not seen photos of people walking around the area, which must have come from the opening ceremony. So if you're paying a visit to the ancient forum, don't misunderstand — the temple is well worth a stop. It's impressive even for its sheer scale alone. So I don't want to talk anyone out of going. You absolutely should. After all, entrance to the temple is included in your ticket to the forum and Colosseum, so what's stopping you? Entrance to the Temple of Venus and Rome is to the left of the Arch of Titus as you face the Colosseum, before leaving the forum. Anyone who's visited Rome's Curia in the Forum over the past month has seen China's terracotta warriors, strutting their stuff across the 1,700-year-old Roman marble and porphyry floor. 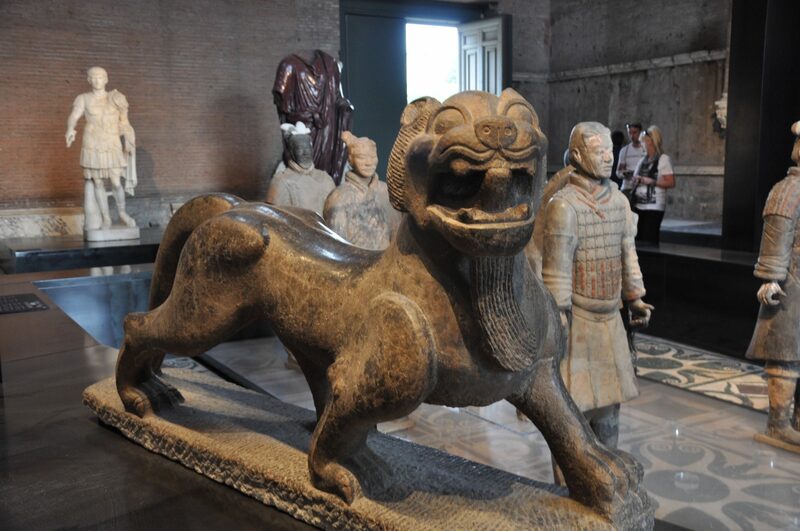 But as I wrote in early October, that exhibit comparing the Chinese and Roman empires was just a taste. This weekend, the full exhibit opens at Palazzo Venezia. Opening on Friday, Nov. 19, the exhibit boasts more than 400 different pieces from the ancient Roman and Chinese empires. It's the first time the two empires have been compared in an exhibit, and it's about time: both empires were extraordinarily influential, as well as contemporaries, with their heights from about the 3rd centuries B.C. to 4th century A.D. It's bound to be a fascinating game of compare-and-contrast. As soon as I see it, I'll report back. In the meantime, if you can, go yourself. The exhibit is at the Palazzo Venezia from Nov. 19 daily until Jan.9, except for Mondays, Dec. 25 and Jan. 1. It's open from 8:30am-9:30pm daily. Entrance to the exhibit is at Via del Plebiscito 19; for a map, click here. 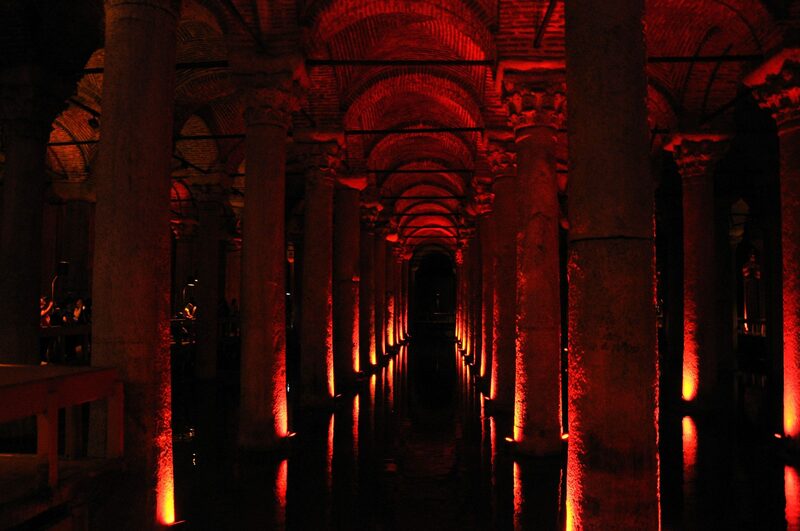 At first glance, Istanbul appears anything but a city tied to ancient Rome. Mosques and minarets, not ancient temples, dot the Turkish capital's skyline; its forum is hard to find, most of its imperial monuments long gone. For a city that became part of the Roman empire in 73 A.D., and was turned into the capital, and dubbed "Nova Roma," by Constantine in 330, it can seem surprising—but to find hints of the city's classical past, you have to look more closely. 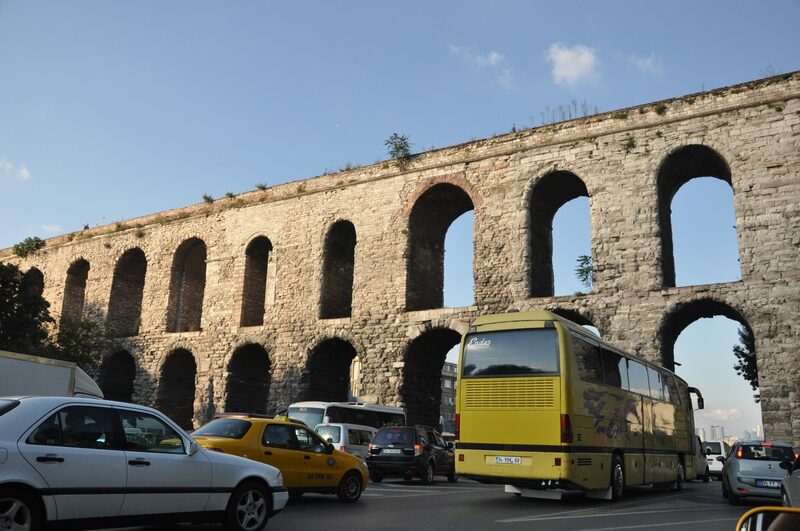 Searching for Roman ruins in Istanbul? Here's where to find them. I'll post this in two sections, so look out for the second installment tomorrow (here it is!). 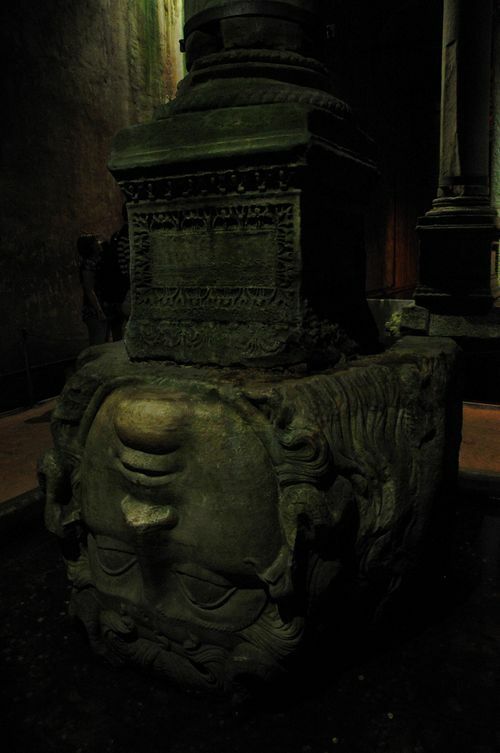 the two upside-down Medusa heads—are particularly intriguing. fish, and a statue of Athena from Troy. was to the ancient Roman empire. main distributor of water through the Middle Ages. 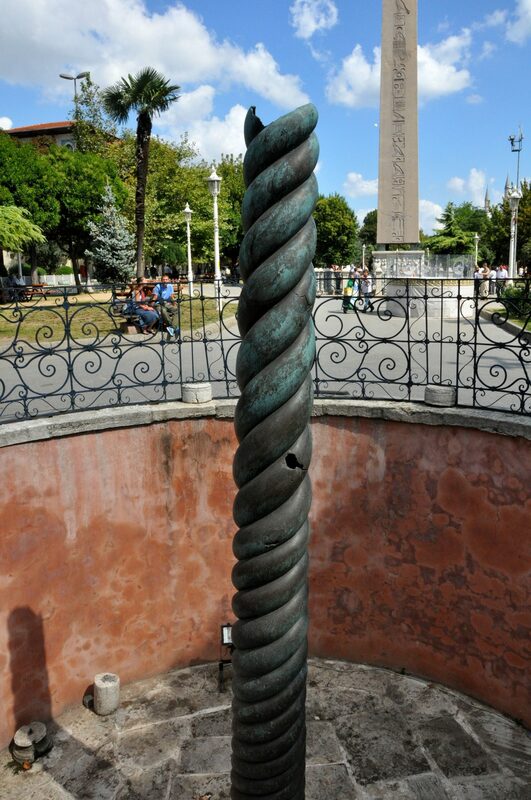 Sultanahmet Square, which more or less follows the lines of the ancient circus. tripod, later lost, initially sat on top, supported by three serpent heads. actually ancient Egyptian, dating to the reign of Tutmoses III around 1450 B.C. re-erecting it in just 32 days. Here's where to find Istanbul's ancient Roman sites, part II! You can visit Rome, tour the forum, Pantheon and Colosseum, even visit the Baths of Caracalla, Hadrian's villa at Tivoli, and the ancient aqueducts — and you still won't get a full sense of the Roman empire. The only way to do that is to visit Istanbul, founded as Constantinople — the new capital of the ancient Roman empire — in 330 A.D. When people say the Roman empire "fell" in the 5th century, they're wrong. The eastern half soldiered on. It was later dubbed the "Byzantine empire" by historians who wanted to make a nice, clean break for the timeline… but those living in Constantinople at the time would have considered themselves Romans. Constantinople continued as the empire's capital for nearly another millennium. And many traces of the city's Roman past still remain. Both the Hagia Sofia and basilica cistern, two must-see sites, were built in the 6th century by Emperor Justinian, who wanted to bring the Roman empire back to its former greatness and reconquer the western half. Then there's the hippodrome built under Emperor Septimius Severus in the 3rd century, and Constantine's inaugural column of 330, and the classical sarcophagi, mosaics and other artifacts of the Archaeological Museum. In a sense, Istanbul is Rome, its successor and its heir. I'll be traveling through Turkey for the next week, and as I go, I'll be posting about what to do, see and eat. Please enjoy this brief break from the eternal city. I'm sure I will! I finally made it there this weekend, my hopes high. After all, I love the Renaissance and ruins. What could possibly go wrong? Nothing went wrong. But given all the hype, I was a little underwhelmed. First, Villa d'Este. 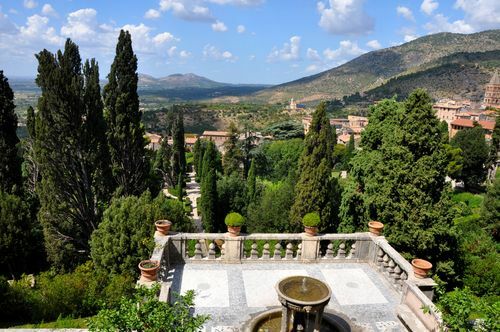 A UNESCO World Heritage site, the villa, built by Cardinal Ippolito II d'Este in the mid-sixteenth century, is like a fairyland-gone-slightly-to-seed. The gardens are filled with grottoes, fountains, and odd touches of whimsy: a fountain of Artemis of Ephesus, the goddess of fertility, her breast-like decorative gourds spouting; an organ hid within an elaborate sculptured fountain; grottoes once filled with movable wooden cut-outs of creatures. Odd stuff, but with some of the sculptures missing and mechanization not working, a little less enrapturing than it would have been, say, for Ippolito. The palace itself, too, feels a bit Alice-in-Wonderland. 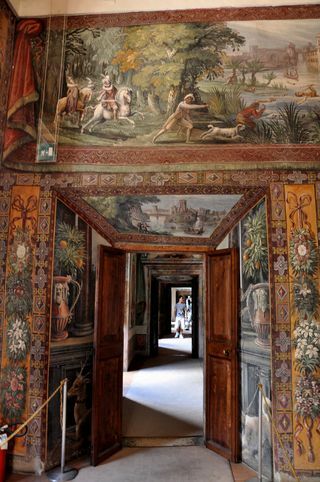 A wander through yields room after room of colorful Mannerist frescoes and examples of tromp l'oeil, that tricksy French attempt to make you think that the flat surface you're looking at is three-dimensional. But despite the sheer amount of paintings, if you're more of a Renaissance or Baroque lover — or you've simply been spoiled by, say, the quality of frescoes at the Vatican — the palace seems better-suited for a fairly quick walk-through than an in-depth artistic experience. Then there's Hadrian's villa. Built as the emperor's retreat from Rome in the flat valley below Tivoli, it's a sprawling, 250-acre complex of ruins, olive tree groves, and, well, dust. Hadrian designed much of it himself, and its buildings and fountains drew on styles he saw across the empire, from Egypt to Greece. But walking through the villa almost felt like walking across the empire itself. Even getting from the parking lot to the first section of the ruins takes about 15 minutes; getting a full overview of the villa would mean a half-day of wandering, or more. The pay-off didn't seem quite worth it. Much of the area remains unexcavated, while a lot of the ruins themselves are surprisingly unassuming. 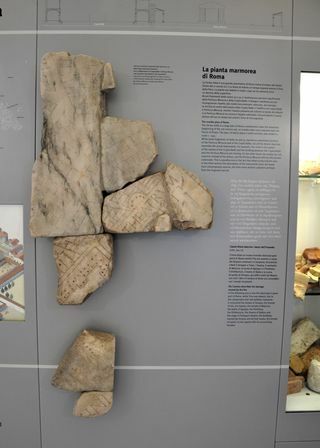 Nor is the signage that helpful — a common complaint at archaeological sites, but all the more frustrating in a site this sprawling. Some of the descriptions of structures didn't even say what they were used for. Even so, some parts of the ruins are striking. The Serapeum, designed after the Egyptian city of Canopus, features a long, green pool, ending in a domed grotto, lined with classical statues. And if you're a sucker for the personal, the (barely-there) ruins of the temple and tomb of Antinous, Hadrian's young lover whom he deified after his death, are poignant. Still, it was hard to get a feel for what the entire villa would have felt and looked like. 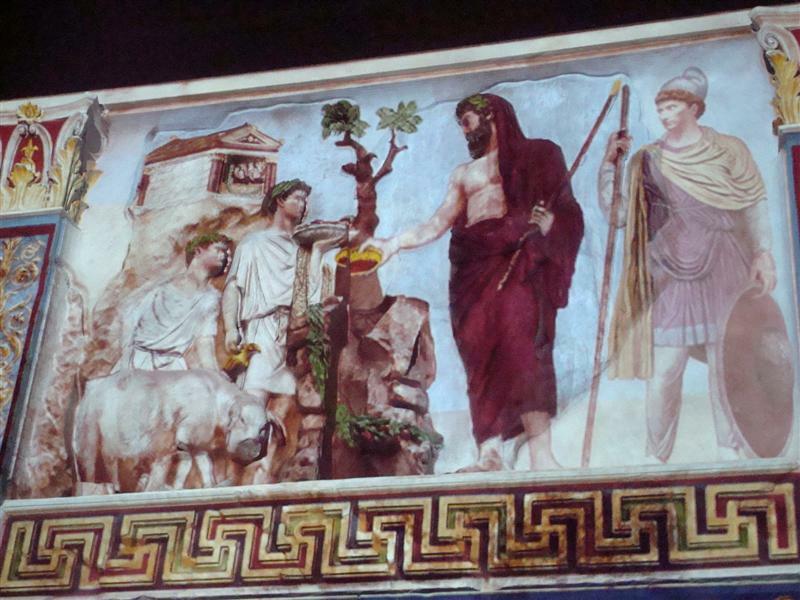 And as with so many ruins around Italy, all the "good stuff" was gone: The best statues, mosaics, and frescoes have all been moved elsewhere… particularly to Rome. In short: Villa d'Este's appealing, particularly on a nice day, but not one of the top-five daytrips I'd recommend from Rome. (Unless for convenience only). 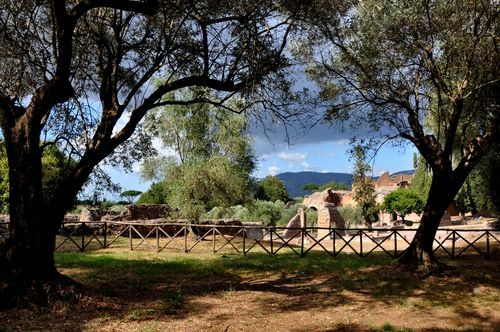 And unless you're a big Hadrian fan, or are going to Tivoli anyway and want to fill out your day, I'm not sure that Hadrian's villa would be one of my top recommendations. For huge ruins that pack more of a punch in a smaller space, check out the Baths of Caracalla, in the heart of Rome; for a better-preserved sense of Hadrian's architecture, visit the Pantheon; to see the artistic treasures themselves, head to the Capitoline and Vatican museums. For more information about Villa d'Este, click here. For more information about Hadrian's villa, click here. Entry to each site costs €10. To get there, you can take a train from Rome's Tiburtina station to Tivoli (about 30 minutes), then a shuttle bus to the town center and Villa d'Este. Another shuttle would be needed to take you to Hadrian's Villa. For those who really geek out on Rome's ancient past, there's no better monument to the Roman empire's engineering skill than its aqueducts. (Okay, okay, there is the Colosseum. And the Pantheon. But to fully grasp how ancient Romans made everyday life easier for their citizens — like by bringing thousands of liters of water into the city each day — you can't beat a glimpse of the ancient aqueducts). 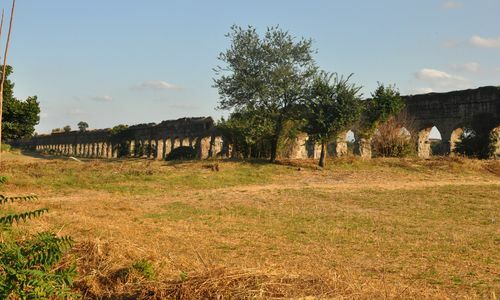 You can still see the Claudian aqueduct, in all its slightly-degraded glory, at the Parco degli Acquedotti, 5 miles outside the city center. 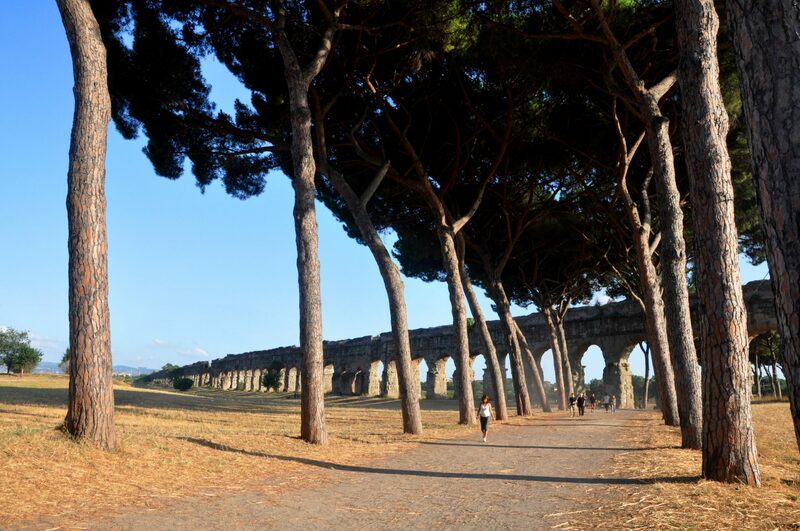 The Aqua Claudia cuts right through the park as it reaches the end of its 45-mile run. Most of the aqueduct is underground; here, though, you can see it above ground in all its arch-on-arch glory. That's not to mention the technical skill it required: Romans designed their aqueducts to drop precisely 6 inches per Roman mile. Imagine doing that, for miles and miles… without computers. The result? The Claudian aqueduct carried 2,200 liters of water per second into the city of Rome. That made it alone able to serve every single Roman district. Yet there were at least 10 other aqueducts (18 if you count the separate branches) leading into the city. 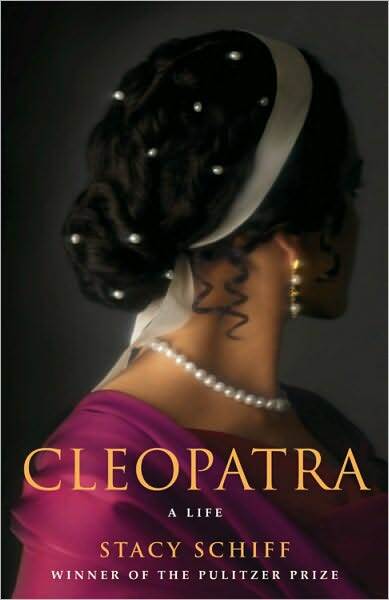 Aqua Claudia strikes history lovers for another reason, too. Some of Rome's most famous emperors had a hand in the aqueduct. Emperor Caligula started building (38 AD), Claudius completed it (52 AD), Vespasian restored it (71 AD) and Titus restored it again (81 AD). Do the Romans still use the ancient aqueducts? Yes. And if you go to the park, here's your proof. Look closely at the aqueduct, and you can see that modern piping lays on top of it. All that aside: Unless you love ancient Roman engineering and are really keen to see aqueducts, this isn't one of the sites I'd recommend doing if you have, say, fewer than four or five days in Rome. There's simply too much else in the center to see. But if you have a little more wiggle room, or perhaps are returning to Rome for a second or third time, consider taking a picnic lunch out to the park or doing a bike ride. The park's biggest draw, especially during high season? It's a great way to appreciate ancient Rome… but the without crowds or costs of more central sites. To get to the Parco degli Acquedotti, take the metro out to Cinecittà on the A line. For a map, click here. 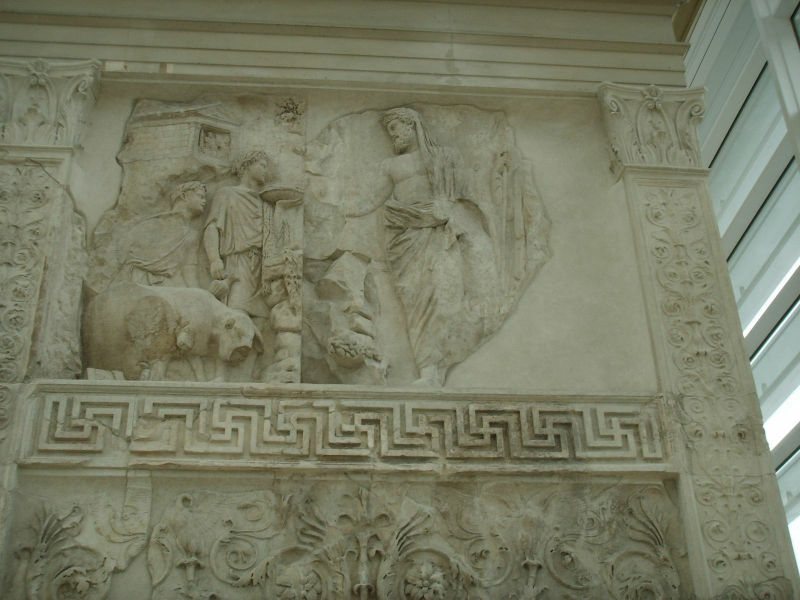 On Wednesdays throughout the summer, you can see the Ara Pacis — the elaborately-carved, beautifully-preserved ancient altar dating from 9 B.C. — as it was meant to be seen: with color. It's hard enough to imagine ancient Rome as it would have been: marble temples, colossal monuments, extraordinary baths. 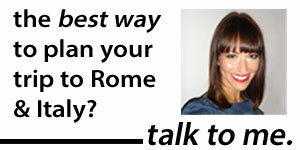 But what most visitors to Rome don't realize is that you have to take something else into account, too. You have to imagine everything painted. That's right: everything. The monuments, the sculptures, the buildings. It wasn't all shining white marble; it was also reds and yellows and blues. And greens and purples and pinks. And…. The difference that color makes is dramatic. 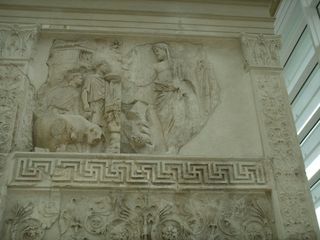 There may be no better example of that than the Ara Pacis. Created in honor of Emperor Augustus in 9 B.C., the monumental altar symbolizes the peace and prosperity that the first emperor brought about. 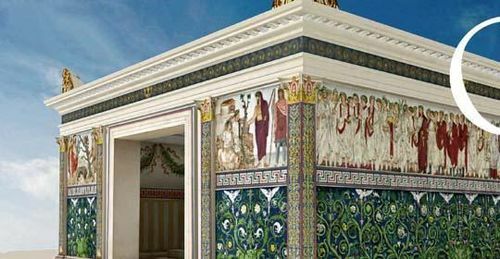 When you go to see it at the Museum of the Ara Pacis, it appears elegant and elaborate — but when it was painted, it would have been much more than that. It would have been striking in its vibrance. Don't believe me? 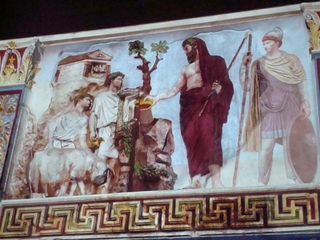 Here's the panel of Aeneas sacrificing to the Penates (the household gods), with color and without, left. The color makes a big difference, no? From now until September 8, from 9pm to midnight (last entrance 11pm), on Wednesdays only, you can see the Ara Pacis colored as it would have been (or so the best guesses have it) with lasers. At € 8 for the entrance, it's pricier than the usual € 6.50 entrance. But unless you want to get a super-close look, you don't even have to pay: Standing outside the glass-walled Museum of the Ara Pacis might be good enough. Either way, make sure you see it. It's a special event, and it ends soon. For more information, click here. For a map, click here. 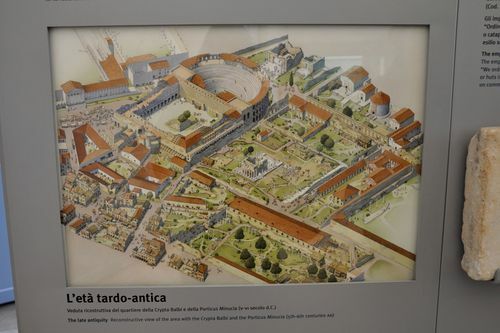 For most of history, the home of Rome’s very first emperor and Julius Caesar’s grandnephew, Octavian Augustus, lay undiscovered. That changed in 1961 when Palatine excavations revealed a fragment of painted plaster. Further digging unearthed a house. 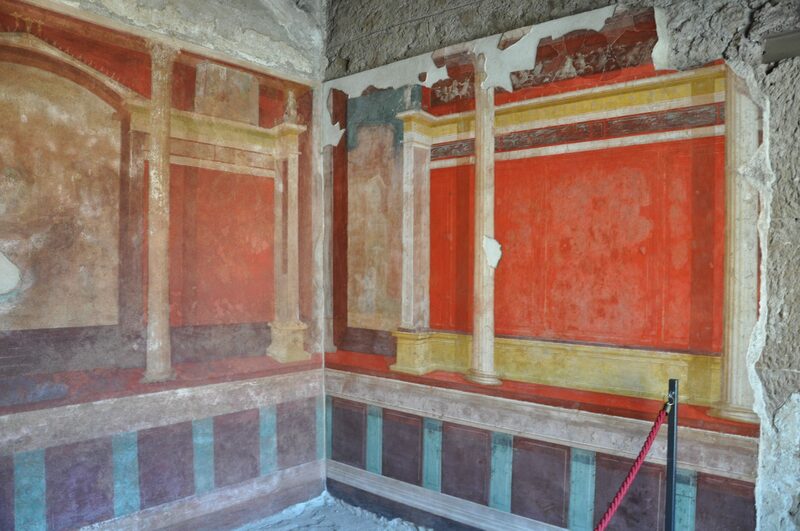 But not just any house: the palace that Octavian lived in for 40 years, both before and after he became emperor. Only in 2008, after decades of restoration, did the House of Augustus finally open to visitors. Even so, most tourists, even those who visit Palatine Hill, still don’t know about it. And that’s a shame. a modest dwelling remarkable neither for size or elegance.” Instead, it’s breathtaking for its vibrant, well-preserved frescoes. Better yet, they date from a particularly poignant time in Rome’s history; they were done just a year after the Battle of Actium, when Octavian defeated Mark Antony and Cleopatra–bringing about their demise, the seizure of Egypt, and Rome’s eventual shift from republic to empire, in one fell swoop. If you decide to visit, know that you might have to wait. Given the frescoes’ fragility, only a handful of visitors are allowed in at a time. But it’s worth the line to get to walk through Octavian’s dining room, bedroom, and reception hall. And the upside is that, if you linger long enough, you can get Octavian’s house to yourself. Maybe, if you squint your eyes, you can even imagine him standing in the same spot where you are. Maybe he’d be weighing the merits of getting himself named emperor, which would happen three years after the frescoes are finished. Maybe he’d be trying to figure out how to handle Egypt. 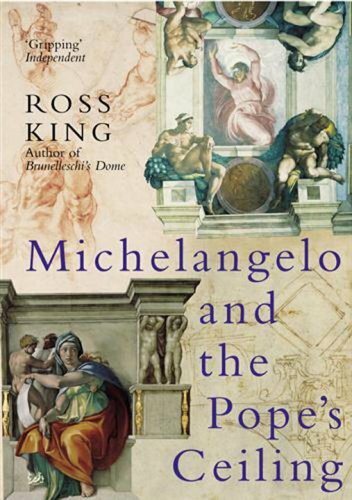 Or maybe he’d just be contemplating his brand-new frescoes, thinking that, given his wealth and power, he could reward himself with that much elegance. Little would he know that 2,000 years later, we’d be able to appreciate it, too. 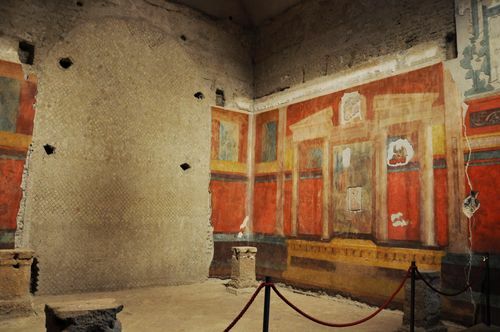 The House of Augustus is open Mondays during the summer from 10:30am to 1:30pm, and on Wednesdays, Thursdays, Saturday, and Sunday from 8:30am to 1:30pm. It’s also open throughout the year. Entrance is included in your €12 forum, Colosseum and Palatine ticket price. Just make sure to double-check opening times at the ticket office, as in Italy, they’re often subject to change.